I discovered a bug in a rom dump for the system Z80NE (ep382.ic5), due to a typo I made 40 years ago (!!!). Perhaps do you know who to contact to make a new hash of the rom file, so that the fixed rom works in mame? No, I'm not Roberto Lavarone, he wrote the source but he's another person. 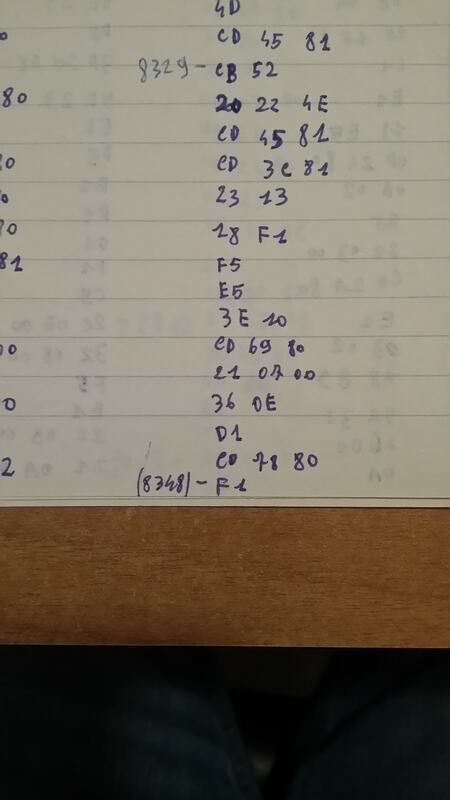 When I manually dumped that eprom 40 years ago I wrote it on a piece of paper, then the original 2708 eprom was broken. After many years I recreated the eprom starting from the written paper, but thanks to my bad writing skills I misread a "CD" and programmed a "C0" in the file (look at the following image: it's the last "CD 78 80"). I never noticed that bug because it's very hard to happen: infact that is part of the error checking routine related to writing to cassette tape, but it can't almost never happen because it could be fired only in case of a hardware communication error between the CPU and the UART, and that's almost impossible.